High in the hills of Valencia, a forgotten house guards its secrets. Untouched since Franco's forces tore through Spain in 1936, the whitewashed walls have crumbled, the garden, laden with orange blossom, grown wild. Emma Temple is the first to unlock its doors in seventy years. Guided by a series of letters and a key bequeathed in her mother's will, she has left her job as London's leading perfumier to restore this dilapidated villa to its former glory. It is the perfect retreat: a wilderness redolent with strange and exotic scents, heavy with the colours and sounds of a foreign time. But for her grandmother, Freya, a British nurse who stayed here during Spain's devastating civil war, Emma's new home evokes terrible memories. As the house begins to give up its secrets, Emma is drawn deeper into Freya's story: a story of crushed idealism, of lost love, and of families ripped apart by war. She soon realises it is one thing letting go of the past, but another when it won't let go of you. There are two stories in The Perfume Garden. The story of Emma, set in 2001, and the story of Freya (Emma's grandmother), Rosa and Macu, set in 1937. Emma is going through a difficult period in her life. She separated from her long term boyfriend, Joe, after finding out that he was cheating on her with a close friend and business partner. Her late mother left her company to the three of them and the two then decided to sell it without consulting Emma.. To make matters worse when her mother died, Emma and Joe gave in to the unresolved feelings between them and Emma is now pregnant. When Joe is killed on 9/11 Emma feels it is time to make a fresh start and prepare to receive her baby. Armed with a box of letters that her mother wrote to be opened after her death she decides to move to Spain, to Valencia, where her mother left her a house, the Villa del Valle. In 1937 Freya and her brother Charles are in Spain to help fight fascism. She is a nurse caring for the wounded on the Republican side and he is a photographer and a soldier. It's through their eyes that we see many of the famous characters of the time: Hemingway, Capra, Gerda Taro... all fascinating people who were risking their lives fighting for a cause they believed in and to tell the world what was happening in Spain. In fact some of them lost their lives doing just that... Rosa is Jordi del Valle's girlfriend, she has fought with him in Madrid for the Republican side but she is pregnant and he decides to take her to Valencia and leave her in the care of his brother Vicente. Macu is there to help her around the house and they form a friendship that will later include Freya. 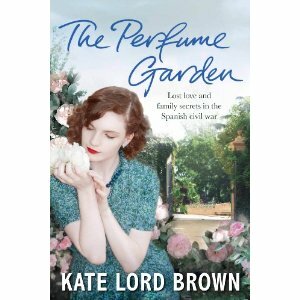 I loved it how Kate Lord Brown slowly feeds us the information about what happened to the characters during the Spanish civil, I loved how it is obvious that she made a great deal of research and managed to share a wealth of information through what her characters did, felt and suffered. I have to say that I was much more interested in what was going on in 1937 than what was going on with Emma. But the author managed to take Emma on a journey about rediscovering her roots and it felt as if I was right there with her finding out, bit by bit, what had happened to Rosa and Jordi and Macu. When Emma finds Macu, she doesn't realise that she is the one that can tell her all the secrets, but we do. And I kept wishing that they would finally sit down and actually talk about the past, especially when Emma starts to realise that those secrets have something to do with her. I highly recommend this book to everyone who likes a good story with strong female characters and I especially recommend it to those with an interest in modern Spanish history. The Civil War and what happened afterwards are still open wounds in Spain's society. I don't think that having a "pact of silence" about it helped. The victims and their families deserve to be remembered, not forgotten. And keeping the memory alive, in historical records as in historical fiction, is one way to prevent the past from repeating itself. Grrr Ana! You make me want to read this NOW but I still haven't read this author's last book! That's some good reading you have planned there Kelly! I hope so!! Always a bit of fear, but both awesome authors. I hope you can read it. I'm pretty sure it will be one of my favourite books for 2012. I hadn't heard about this book. Thanks! I love books set in the Spanish Civil War. My critique partner's work is set in Spain and she's gotten me immersed. I was intrigued by Waiting for Robert Capa, which I read a while back. I'll have to add this book to my list. The thirties are also the setting of my work, and as a decade, that era has a melancholy current running through it that is unmatched by any other. One war over. One war on the way. Interesting thought. Good luck with your work.